Double your ad impact by combining our durable counter mats with an exceptional, eye-catching counter top display. Displays are custom designed to meet your exact size, shape, and color specifications. Eye-catching merchandising displays are the backbone of a good retail marketing campaign. 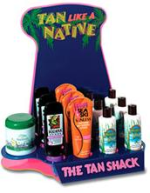 Innovative and well-designed point-of-purchase displays from BetterCountermats.com can dramatically increase your odds for sales success in today's competitive marketplace. We offer design, engineering and prototyping on all types of custom displays. Literature holders are the next best thing to a handshake with your customers. Our attractive display stands can be custom printed with your company logo. A large variety of stock designs are available.